Patriot militia led by Col. Francis Locke, on June 20, 1780, defeated Tories led by Maj. John Moore 400 yards west. When many envision the Revolutionary War, the image of professional soldiers, arranged neatly and in distinct uniforms, comes to mind. As drums sound off, the first line of the Continental Army advances, marching briskly to engage the first British line across the battlefield. In reality, however, most of the skirmishes and full battles of the War for Independence fought in North Carolina pitted Loyalist militia against their counterparts for the Patriot cause. Few participants had ever received formal military training, and often, the only distinguishing feature between a Tory and a Whig were small adornments in their hats. 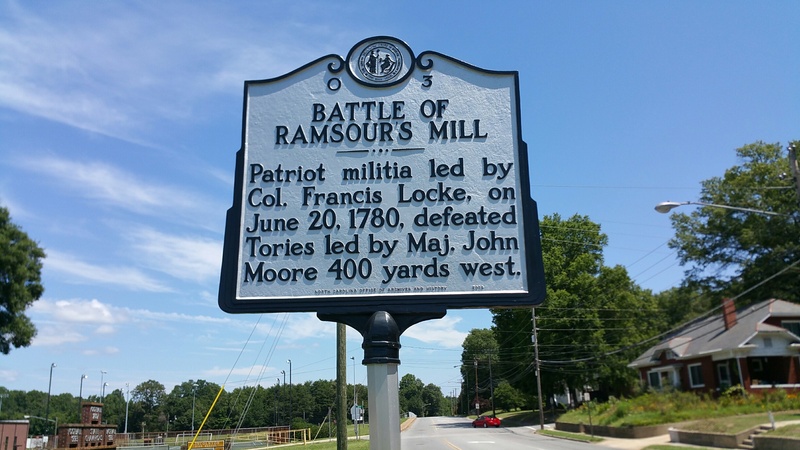 Farmers, not soldiers, determined the outcome of most Revolutionary War battles fought in North Carolina, and like the battles at Kings Mountain and Moores Creek Bridge, the Battle at Ramsour’s Mill was no exception. In hopes of supplementing Cornwallis’s British force at Camden with volunteers from the North Carolina countryside, on June 13, 1780, militia Major John Moore gathered a force of 1,300 Tories on the grassy meadows near Derick Ramsour’s Mill in present Lincoln County. Knowing this, Patriot militias mobilized and began marching to the mill, but an advance force of no more than 400 Whigs, led by Colonel Francis Locke, arrived near the Tory encampment on the evening of June 19. After conferring with his officers, the decision was made to attack the Loyalists, who had fortified their position near the mill. As dawn broke on June 20, Locke and his Patriot force stormed the Loyalist defenses. 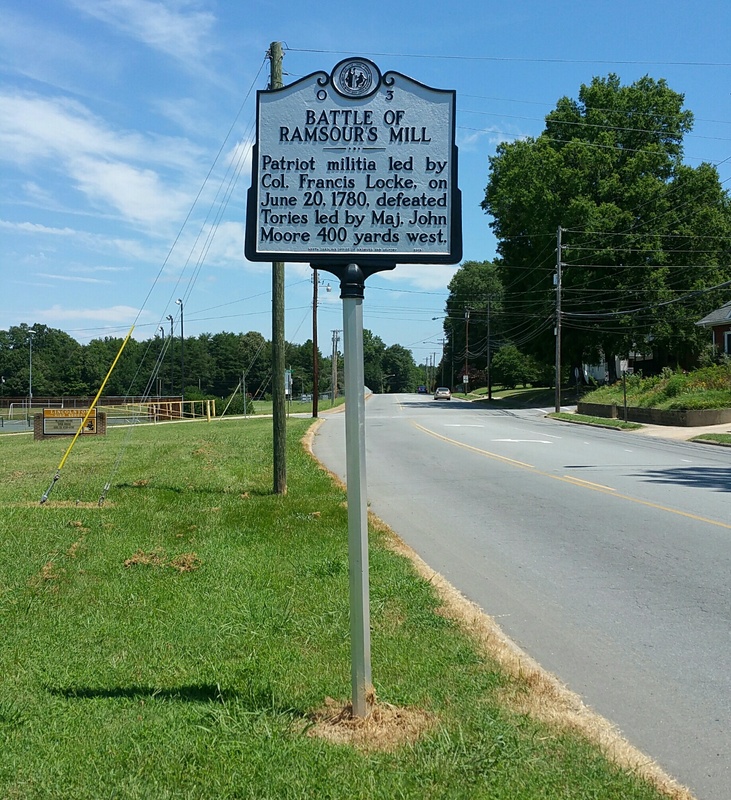 The fighting at Ramsour’s Mill soon degraded into little more than a killing field. The participants, mostly farmers lacking military discipline, broke ranks and some used their rifles as blunt instruments to split heads and crush bones. In the chaos of close quarters combat, many a friend was mistaken for foe, since nothing but a twig in the hat of a Loyalist, or a piece of white paper in that of a Patriot, distinguished one from the other. As a Whig present at the battle related: “In this battle neighbors, near relations and personal friends fought against each other, and as the smoke would blow off from time to time, they would recognize each other.” Even though the Loyalists outnumbered the Patriots almost four-to-one, many Tories discarded twigs in their hats and ran from the fields. Each side lost around 150 men, but the Patriots prevailed since they had uprooted the Loyalists from their position. The battle was indecisive at best, but was illustrative of how the Patriot militia played a significant role in the war, throughout the south in general, and North Carolina in particular.